The Department of Mathematics in Pisa was the first Italian mathematics school formed at the beginning of the Italian Unification and for a long time remained the central driving force of mathematics in Italy. Its creation was facilitated by the presence of the Scuola Normale Superiore and the strong scientific contacts that Bernhard Riemann established with Enrico Betti and Eugenio Beltrami during his long stay in Pisa between 1863 and 1865. These two mathematicians, together with their teacher Ottaviano Fabrizio Mossotti, initiated the school. Their work was then continued, directly or indirectly, by their numerous pupils. Among them, as well as Ulisse Dini, who became a professor in Pisa at the age of twenty one, were Eugenio Bertini, Giulio Ascoli, Cesare Arzelà, Salvatore Pincherle, Gregorio Ricci Curbastro, Vito Volterra, Luigi Bianchi, Carlo Somigliana, Luigi Berzolari Cesare Burali Strong, Mario Pieri, Federigo Enriques, Giuseppe Vitali, Guido Fubini, Eugenio Elia Levi, John Samson, Louis Fantappié and Mauro Picone. All these distinguished mathematicians were educated in Pisa. Leonida Tonelli was instead educated in Bologna, at the school of Cesare Arzelà (who himself had been a pupil of Ulisse Dini in Pisa), and then taught in Pisa for many years. The revival of mathematics in Pisa, following the extremely difficult years after the Second World War, is in part owed to one of Arzelà’s pupils, Alessandro Faedo, who was Dean of the University of Pisa for many years. This rebirth began with Federico Cafiero’s calling to Pisa, a pupil of Renato Caccioppoli, and reached its peak in the 1960s with the arrival of Aldo Andreotti, Jacopo Barsotti, Enrico Bombieri, Sergio Campanato, Gianfranco Capriz, Ennio De Giorgi, G. Prodi, Guido Stampacchia and Edward Vesentini. Since then there has always been a policy of open recruitment and attention to quality which, in addition to the direct or indirect students of the great masters of Pisa, made it possible for numerous researchers from different backgrounds and training to reach Pisa, some not even Italian, who have been or are still members of the Department. Furthermore, since the 1960s, the Pisa mathematics community has retained numerous and fruitful relationships with the best international mathematicians who have often spent long periods of study in Pisa. This is witnessed, for example, by historical seminars given by E E Levi, Grauert, Hironaka, Norguet, Smale, Thom, the honorary degrees conferred to Louis Nirenberg, Heisuke Hironaka and François Treves and the honorary doctorate awarded to Enrico Bombieri. Today’s Department of Mathematics stems from the merging of the "Leonida Tonelli" and Applied Mathematics "Ulisse Dini" departments in 2012, bringing together the entire mathematical community of Pisa. The traditional role of supporting and strengthening research is now joined by the programming, organization and management of all mathematics courses offered by Pisa University and, in particular, by the undergraduate and graduate degree courses in Mathematics. The solid preparation provided by these courses is demonstrated not only by the large number of young graduates who complete their research training abroad or find their first placement in universities or foreign research centres, but also by the encouraging employment statistics of our graduates and researchers, also in fields outside the university. One of the key elements of the Department is the PhD program, which has been running since 1983 and has received strong encouragement from the "Galileo Galilei" graduate School. The School was active from 2001 to 2012 thanks to government funding and offered PhDs in Mathematics, Physics, Applied Physics, Computer Science, Chemistry and, more recently, Earth Sciences. It has been an example of a particularly successful policy of careful research and significant awareness of the importance of higher education. We must also remember the Department’s involvement as a founding member, together with the Scuola Normale Superiore and the Sant’Anna School of University Studies, in the "Ennio De Giorgi" Centre for Mathematical Research. 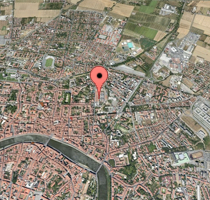 Started in 2001 as a result of the experience of the MaP (Mathematics in Pisa) project and currently one of the main European mathematical centres. Finally, the quality of the Department’s research is also confirmed by the excellent results obtained in the CIVR 2001-2003 and VQR 2004-2010 assessments conducted by national research evaluation agencies, as well as the Department's position in international rankings.